West and South of Hamlin Story you will find yourself on a winding sandy road lined with towering poplars, a little church nestled on a hilltop bordered by aspens, the Holy Ghost Romanian Orthodox Church of Hamlin. The steep hill to the church challenged many car drivers especially in inclement weather, so many a church – goer trudged up the steep incline, leaving their vehicles at the bottom, near the cemetery. The church is 36 feet long by 20 feet wide and 12 feet high. The inside of the church resembles those in Romania or in Canada decades ago – no chair or benches. A picture of a bearded priest in vestments is found on the inside cover of a register with the inscription: “To Whom it May Concern” by Notary Public Peter Svarich, Vegreville, Alberta. On the 15th Day of December 1913, the bearer, Teodosie Nica, appeared before me. His pictures appears above and the signature below it verifies to me the identification of this name, character and profession. He is a dully ordained monk of a Vaslui Romania. He came to Alberta in January, 1912 and settled on homestead NE ¼-22-54-14.4, where he built a church for the use of the Romanian Orthodox people. His intention was to build a monastery therein and for this cause solicited funds from the church members and the general public. The monk Teodosie Nica in 1912 built a long cabin with a second story used as a chapel for services until 1916. On January 22, 1915, the first meeting was held to build the “Biserica Altoficiate Romana Ortodocsa cu hramul Pogoriria Duhului Sfant”, as it officially named. An interesting footnote to the first meeting minutes is that: “si Biserica ave sa ramae Supt Guvernu Canaza Nu sa va da nici supt Omesie Provintiea in Albert Dara Preuta vorbit intaea sedinta la Poporuni Romanii”. (and the church should remain under the Government of Canada – but the priest who will serve are requested to be Romanian Greek Orthodox and to serve in the language spoken from the beginning by the Romanian prople.) Even in 1915 the Romanians wanted their parishes to be served by Romanian priests. The following year 1916 the “main church” for the monastery was built. The 10 acres on which the Church was built and the cemetery located on was originally given by the Dominion Government. Father Teodosie Nica served the Parish needs till1918. A local pioneer, Elie Aldea, was ordained priest and served the parish for a time. By June 25, 1924 the outside of the church was completed. On February 3, 1924 the parish received the following books: Sfanta Evangelie, Octoihul cel mic, Sfanta Scriptura, Canonul si Apostolul Crestin, Cazania, Penticostarul”. Following the death of Father Elie Aldea, the parish relied on priest from Boian for their services. Boian is 15 miles soth of Hamlin store across the North Saskatchewan River. Some priests who served at Hamlin were Vasile Cohan, Father Teodosie Scaletschi, Father Vasile Toma, Father Dumitru Diaconescu, Father Mircea Panciuk, Feather Fiiko (Boian), Feather Horbay (Hamlin), and Father Oleniak. Today, 90 years after the arrival of Father Teodosie Nica, church services are held once a year on the Monday following the Sunday of the Descent of the Holy Trinity. On May 22, 1972 the church was visited for the first time Bishop, Archbishop Victorin, with Archimondrite Felix Dubneac, Feather Jerome Newvile, and Father Panciuk. They held prayers for the deceased parishioners, buried in the cemetery. When there is a priest to serve the parish, graveside services are held in memory of the deceased. Since the first burial, January 28, 1916, there have been 35 burials, in the cemetery. To date, the last burial was that of Nickolae Aldie on November 12, 1986. The remaining few parishioners resisted the efforts by some to move the church to a Heritage Museum. 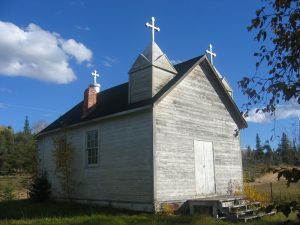 The Church still stands as proud as ir did in 1916 and is a living monument to those early hearty pioneers of Romanian Orthodox faith who came to Alberta and helped open Canada’s greatest frontier more than 90 years ago.